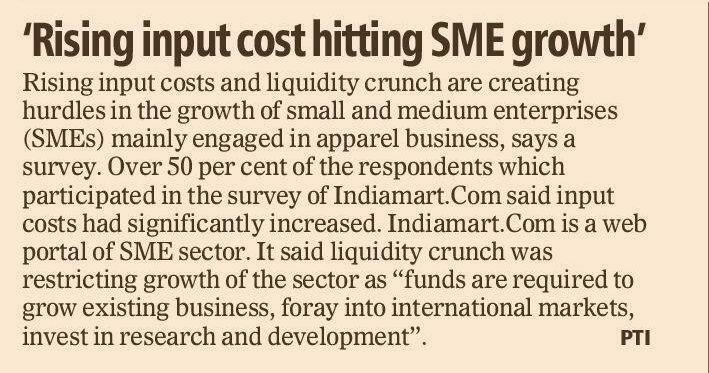 New Delhi, May 22 (PTI) Rising input costs and liquidity crunch are creating hurdles in the growth of small and medium enterprises (SMEs) mainly engaged in apparel business, says a survey. Over 50 per cent of the respondents participated in the survey of Indiamart.com said that input costs have significantly increased. Indiamart.com is a webportal of SME sector. Micro, Small and Medium Enterprises contribute over 40 per cent to the country”s total exports, 45 per cent to manufacturing output and 8 per cent to the country”s GDP. The sector employs about 60 million people.